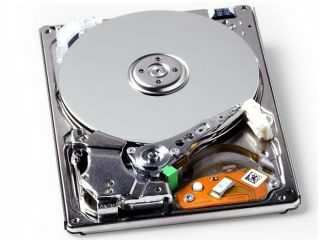 Because it has been mostly confined to Japan, we haven't heard much about the iVDR class of removable hard drives, but we can bring you news of a clever new development. Hitachi Maxell has just unveiled a prototype cartridge-based iVDR with a small e-paper screen on its face for checking both how much storage space is left and what's on the drive. The iVDR format comes in two varieties – one, like Hitachi's newcomer, in a plastic cartridge for plug-and-play use in an appropriate reader and another that slots into desktop PC drive bays. Although there's a little more to it, the basic idea of iVDR is to make it incredibly easy for non-technical users to upgrade storage in PCs, PVRs and the like without getting involved with cables and power supplies. Two types of e-paper iDVRs are on the drawing board – one with a small screen that shows only the remaining capacity of the drive and another with a larger screen for showing filenames and thumbnails of images of video clips on the drive. Some Japanese Hitachi Wooo television sets already include iVDR slots for users wishing to increase onboard storage for recorded broadcasts.